“Mindfulness” is a term that seems to be thrown around quite a bit in therapeutic and personal development arenas in recent years. What is it exactly? While it’s easier to comprehend its meaning through practices which promote it, mindfulness can be put in to words in the following way: “…the basic human ability to be fully present, aware of where we are and what we’re doing, and not overly reactive or overwhelmed by what’s going on around us” (mindfulness.org). While mindfulness is an innate part of our human nature, it can and should be cultivated to be a more present aspect of our character. Doing so can have a profound effect on our experience of the world around us resulting in decreased feelings of anxiety and discord, and improved feelings of balance and harmony. It would seem, based on the definition given, minus the “basic human ability” part, that horses are an exemplary example of this practice. Because they are by nature prey animals, horses are wonderfully designed to be highly attuned to the present moment, aware of themselves and their environment, and consequently able to respond appropriately to what is happening around them. How, then, can we learn from their model of this powerful life skill? One of the primary ways that mindfulness is practiced is through the art of meditation, in a variety of forms. While there are many benefits to this practice, such as decreased stress, improved functioning, awareness, and insight, what is most valuable is not the focus on these benefits but rather on the practice itself. This meditation creates a space in which we can “suspend judgment and unleash our natural curiosity about the workings of the mind, approaching our experience with warmth and kindness—to ourselves and others.” (mindfulness.org). The most wonderful practitioners of “suspended judgment” and “natural curiosity” are horses. Observing, understanding, and honoring their behaviors particularly as they provide raw, unfiltered feedback to us about our own can provide a profound model for the practice of mindfulness. Horses are excellent practitioners of being in the moment and responding appropriately. Aside from modeling after their approach to the world, another valuable aspect of interacting with horses to promote our own mindfulness practices is our relationship and communion with these companions. Mindfulness, as we’ve discussed, is about being present and fostering awareness and care in our interactions. Many of the exercises designed to practice and promote mindfulness involve calling one’s awareness to the present moment, its sounds, sights, feelings, etc. In the time that we may be honored to share with a horse, incorporating our interaction in to this type of meditation practice is so powerful. Walking with a horse, listening to its hooves strike the earth, hearing its breathing, listening to the wind in the trees, experiencing its movement either by feeling it move underneath or next to us, and observing the world through its ‘lens’ are some of the most incredible methods for practicing truly being present in the moment. 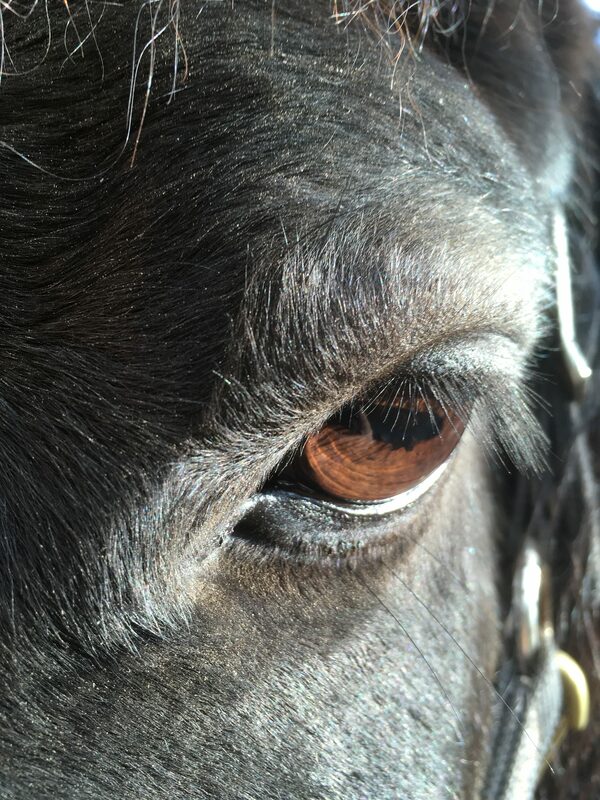 There is discipline in the practice of being acutely aware of these things and telling one’s self, “there is nothing else right now aside from what is happening in this moment.” What a gift to do so with a horse as our model and guide! Mindfulness is something we all have the capacity for and that is an innate part of our nature. How we cultivate and nurture its practice in our daily lives, however, is up to us. Doing so can have profound impact on our own spirit, as well as on those that we interact with and it is so worth the effort. As with many things that we may seek to develop in our lives, doing so with both the modeling and assistance of an equine guide can be the difference between a cerebral understanding and a truly heart-entrenched comprehension. We would love the opportunity to help you tap in to this powerful practice by facilitating an experience with our horses at Red Moon Ranch. We look forward to supporting and encouraging you in your own mindfulness journey!